It seems Urban Outfitters hasn’t learned its lesson when it comes to mixing drug abuse and retail: After previously pulling prescription medication bottle items from its shelves, the store that brings in flocks of teenagers is now featuring a hair salon in a new New York City store called “Hairroin” (get it? 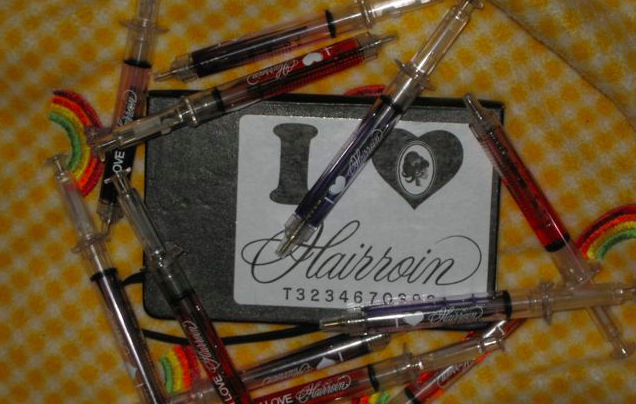 ), where shoppers can apparently get promotional hypodermic needle pens and other items emblazoned, “I Love Hairroin.” This, in a state with an actual heroin epidemic: The number of drug-related deaths more than doubled from 940 in 2004 to 2,044 in 2012, according to the New York Health Department. Consumerist reader Frank wrote in to express his displeasure over the new permanent fixture at a recently opened Urban Outfitters location in NYC. This one is there to stay, but other temporary pop-up salons have ticked off parents with Hairroin promotional items in other cities as far back as 2012. Reader Frank hails from Rockland County, NY, just a bit to the northwest of NYC, where, according to a recent report by the Associated Press, heroin and prescription painkiller investigations have doubled as people of all ages are abusing the drug. A bag of heroin can cost as little as $5 there. “This whole region is going through a massive heroin epidemic that has had devastating effects on the youth. Addiction, overdoses, and jail have been the result for many young people here,” Frank writes. Indeed, New York’s Governor Andrew Cuomo recently called for a crackdown on the surge in heroin use in the state (neighboring New Jersey is also in trouble, with the number of people seeking treatment for heroin abuse there hitting a five-year high of 25,442 in 2012). Speaking at an event at Rockland Community College June 11, Gov. Cuomo said: “This state has a serious problem with heroin, and it has been growing, and it is getting worse, and it is of epidemic proportions at this point,” according to the Democrat Chronicle. As such, our reader says the inclusion of the Hairroin salon and its “sickening theme” and freebie syringe pens is crossing the line. Yes, Hairroin is its own business, with standalone locations in NYC and L.A., that appears to have featured the free pens and other paraphernalia for a while as part of its company’s marketing repertoire, so they’re not technically Urban Outfitters products, perhaps. And yes, parents can tell their teens not to frequent those salons (good luck with that one) if they’re worried about its name or promo swag. But because this is a permanent feature/partnership at this particular Urban Outfitters, we reached out to the UO to see if it had a comment on hosting the salon, considering its status as a purveyor of clothing and other products aimed largely at young people. We’ll let you know if we hear back.